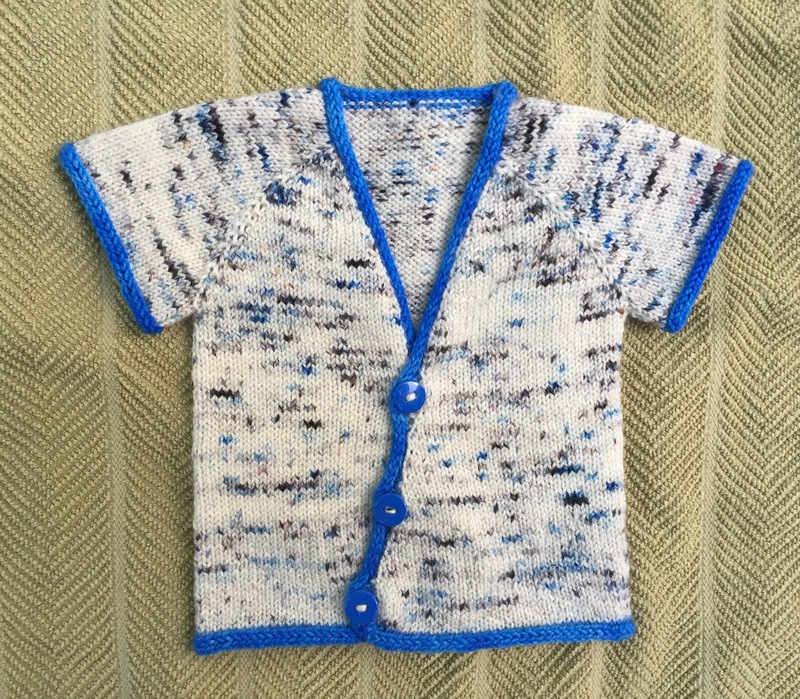 My Journey to Fit: Baby Knits Show and Tell! 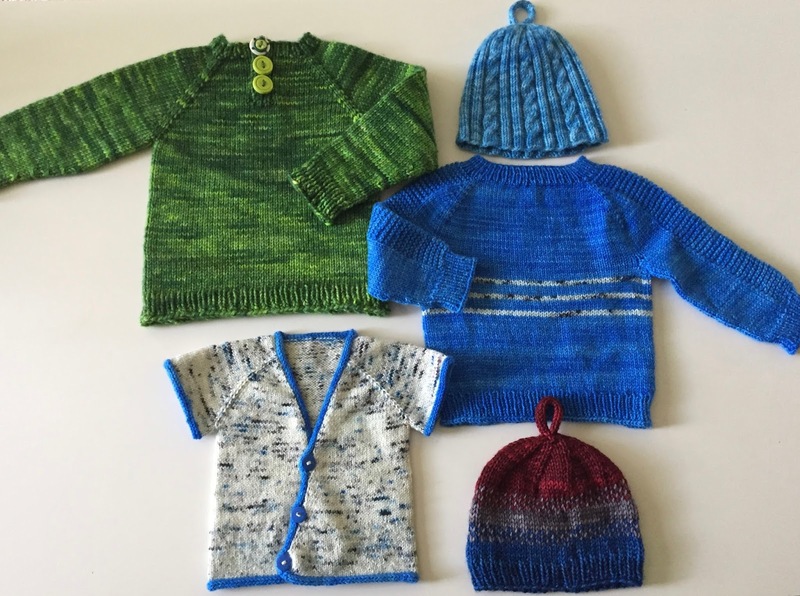 Baby Knits Show and Tell! I had so much fun knitting everything for Cary's baby - knitting for a baby is special in itself, but knitting for a knitter is even better, as they know all that goes into the finished product. 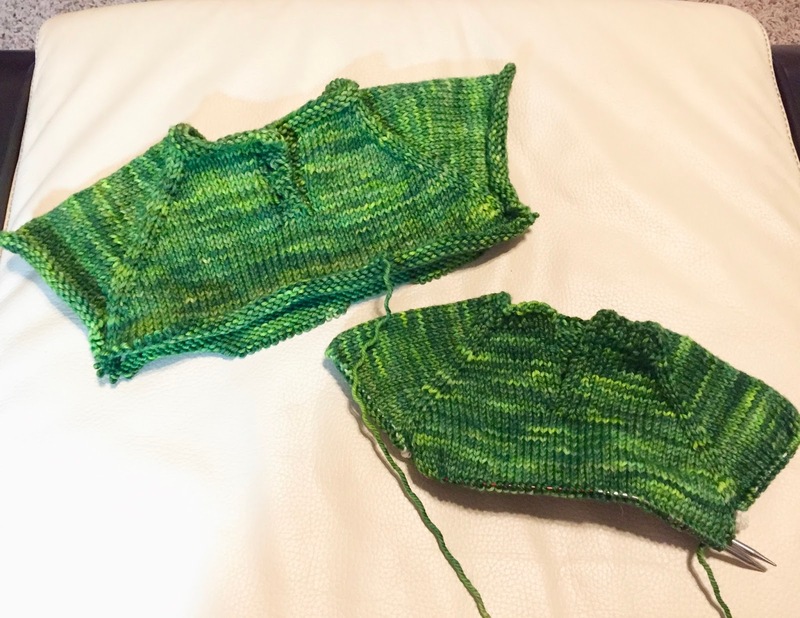 Even though I've been knitting for five years now, and I'm fairly confident on certain techniques, I still had my moments with some items, but I learned a lot - and also realized that I really could use a class on refining parts of my knitting. 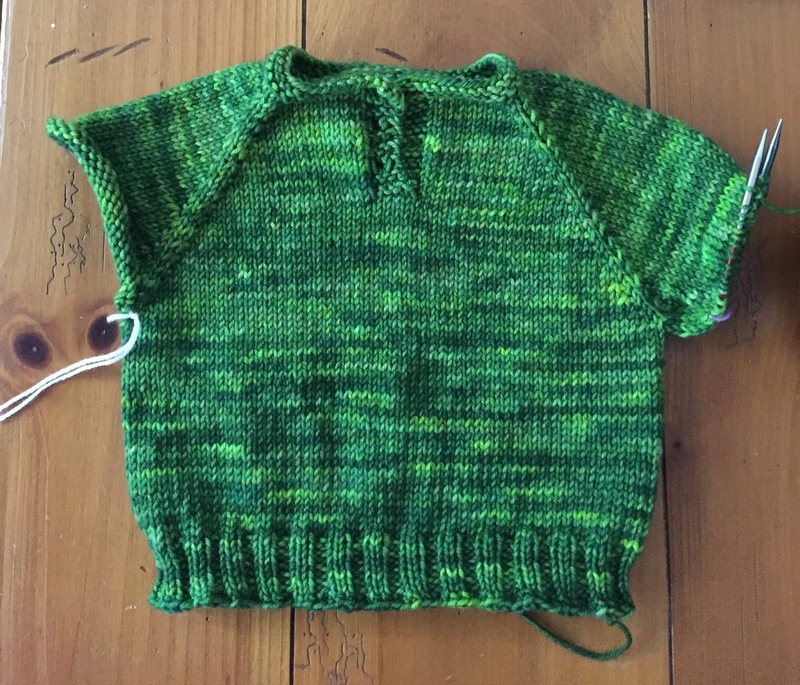 My biggest issues came with sizing - not having a baby in person to judge the size of what I was knitting was challenging! I second-guessed my sizing a lot, and I will admit to holding baby Mason one morning at breakfast and "measuring" across his back with my hand to compare it to what I was knitting - ha! Desperate times, desperate measures. For Baby Pumpkin Muffin, my plans were to knit something in a newborn size, something in a 6 months size so he could wear it this winter, and something in an 18 month size, for next winter. Plus a hat or two. 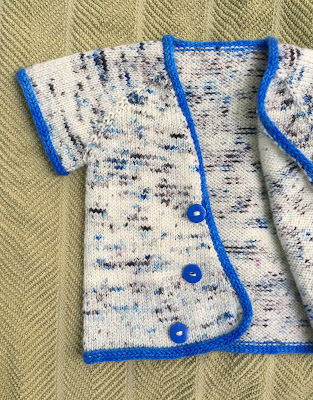 Pattern is One-Piece Baby Kimono. Back is at the top, sleeves are to the sides, and overlapping front pieces are toward the bottom of the picture. I had my reservations, but after blocking (this was necessary to smooth out the stitches so I could see the edges better), I went ahead and started sewing up the sides using the mattress stitch, which is pretty magical - it brought the sides together in a seamless look. But then I got to the sleeves, and you can see by the picture, they are jagged in a stair-step manner - this was how you tapered them, kimono-style. As I sewed them together, I didn't like how it looked. 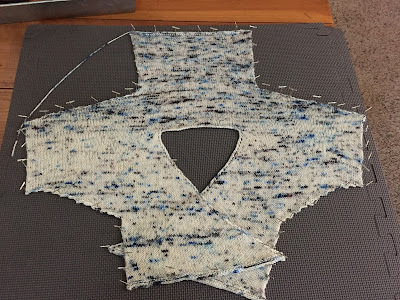 I tried several ways, and then examined other finished kimono projects on Ravelry, and saw that the sleeves all pretty much looked janky. So I set this aside for a while and started on my next project, all the while ruminating on what to do about the kimono. Pattern is Flax Light, yarn is Madelinetosh Sock, colorway is Methanol Blue (stripes are same yarn, but colorway is Stormborn). I named this sweater Triple Stripe Flax Light. Close up of my challenge area. This was so tiny and it was hard for me to picture what I was doing; I was following the extremely detailed pattern, putting in stitch markers everywhere, but in the beginning, just after the neckline was finished, there were so many stitch markers placed to differentiate the pattern on the shoulder/sleeve versus the raglan increases (the diagonal lines in the picture above) that I would get off and knit when I should have purled so I had to rip back several times on this section until I got it right. Once I finally got more of the shoulder and body area done and could see what I was doing, I stopped having that trouble. 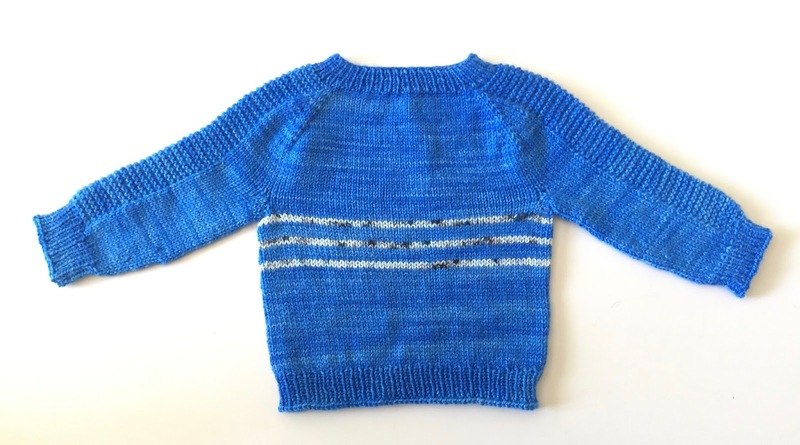 I liked the yarn color but decided that the sweater needed a little extra pizzazz, so I threw in a few contrasting stripes using the yarn from the as-yet unfinished baby kimono. I loved how this sweater turned out, especially the garter stitching going down the sleeve - it's just a simple sweater, but it's so cute. 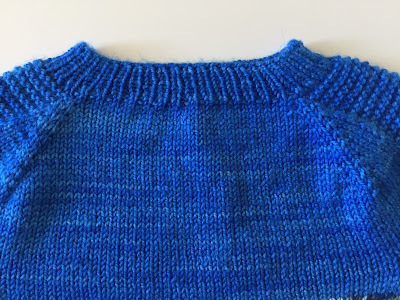 Pattern is A Simple Baby Pullover - I do not recommend it based on the sizing. Even though my gauge (amount of stitches per inch) was correct according to the pattern, this just wasn't working for me - it looked wide and short. Luckily, because it was a heavier yarn, I'd only spent a few days knitting it, which made my decision to find a different pattern and start over pretty easy. Also, this is why I knit with yarn that I love, because the entire process is a pleasure to me - from choosing the yarn to seeing how it knits up, to knitting itself - I wouldn't do this if I didn't like it. Both of these are supposed to be the same size, according to their patterns. Pattern is Thom With a TH, yarn is WC Mercantile Kona 840 Superwash, colorway is Freshly Mowed Grass. This yarn is hand dyed and I loved seeing the color shift as I knit with it. Handmade Fimo clay buttons! I named this sweater Turtles in the Grass, for pretty obvious reasons. Pattern is Hello Kimono, yarn is Madelinetosh Sock, colorway is Stormborn, accent colorway is Methanol Blue. This is a newborn size and it's so tiny! I named this sweater Hello Baby Pumpkin Muffin. Pattern is Golden Pear, yarn is Madelinetosh DK, colorways are Arctic (blue), Tern (gray), and Tart (red). I knew Brian would like this hat (and when he saw it at the baby shower, sure enough, he did) so I named it Yacht Club Pear, in honor of our ongoing joke about fancy sailing clubs. Sweet knitwear for a sweet baby boy! I really enjoyed knitting everything; it was so fun, baby things are just adorable, and I didn't get frustrated, even when things seemed off. The hardest part was not being able to ask my knitting guru Cary a question when I ran into a challenge...and not showing her pictures of what I was knitting, because I usually do! Luckily I had both Diane and Debby to show pictures along the way - this stuff was just too cute to keep to myself! Or at this point, I need to travel to cooler climates so I can wear my handknits! Oh my gosh are these amazing! You really have a gift. If it were me, I'd poke my eyes out with the knitting needles out of frustration. Thanks! I love knitting - if I got to the eye-poking stage, I wouldn't do it. You are amazing. You need to sell your wares. If I am ever a grandmother, I will seek you out. No baby socks because A) my joints were hurting enough with the shaping of the garments - tiny socks really would have been painful at that point; and B) they have a dog who is known for eating socks. Baby socks would be like special little appetizers for him, LOL. Squeeeeee! I love those little baby things. 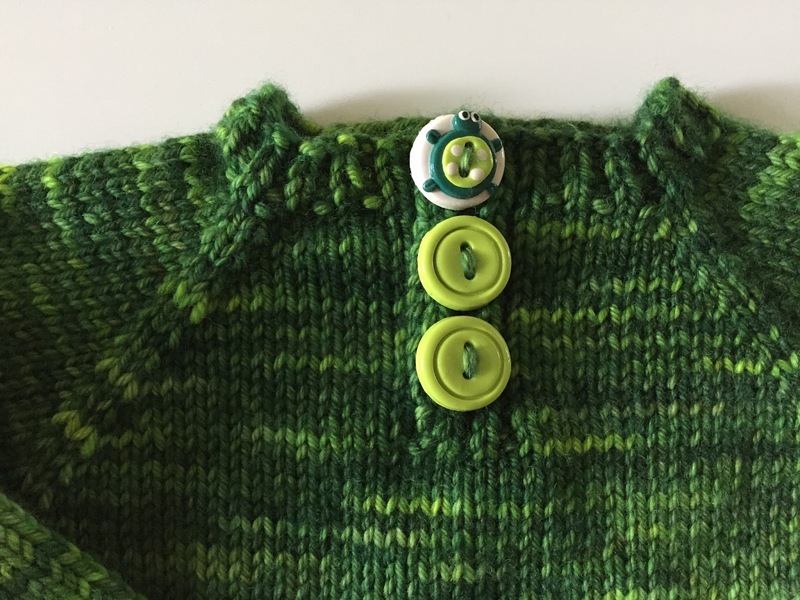 That green sweater with the turtle button!! What a lucky baby to have you auntie Shelley! Isn't that turtle button the best?! O gosh I just love the little kimono! Do I see a new business in your future? Could you sell your stuff at the hospital gift shop? I know, I love that little kimono, too. And no, even if I could crank out enough product to sell at the gift shop, I wouldn't do that - this is for pleasure. Knitting for profit would take the fun out of it. Oh so fun to see all the finished pieces and hear the stories behind them! Re-knitting TWO sweaters? Amazing tenacity. And your finished pieces tell the story of your beautiful workmanship! I think my favorite is that color-stranded hat. Although the turtle sweater is darling. You will have to have a baby fashion show for us! Good thing I like knitting, eh? But I'd much rather reknit something than have a finished product that I wasn't happy with. They turned out fantastic! I am impressed with your patience with restarting the kimono and sweater! About how many hours does something of that size take? 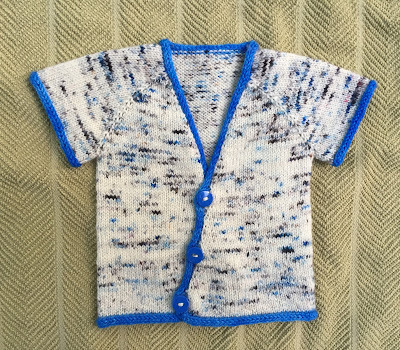 Oh man, I can totally see getting frustrated with the small knits on the sweater - I felt that way when I attempted to make tiny little animals for my snister. You think it will be quick cause it's small, but it's actually slower! Honestly, I can't remember how long it took me to knit the second kimono - less time than the first, I do know that! Adorable! I love hearing about the process, too - so much work goes into it that is just a mystery to us non-knitters. Baby Pumpkin Muffin is going to look so snazzy in his custom-made knitwear! 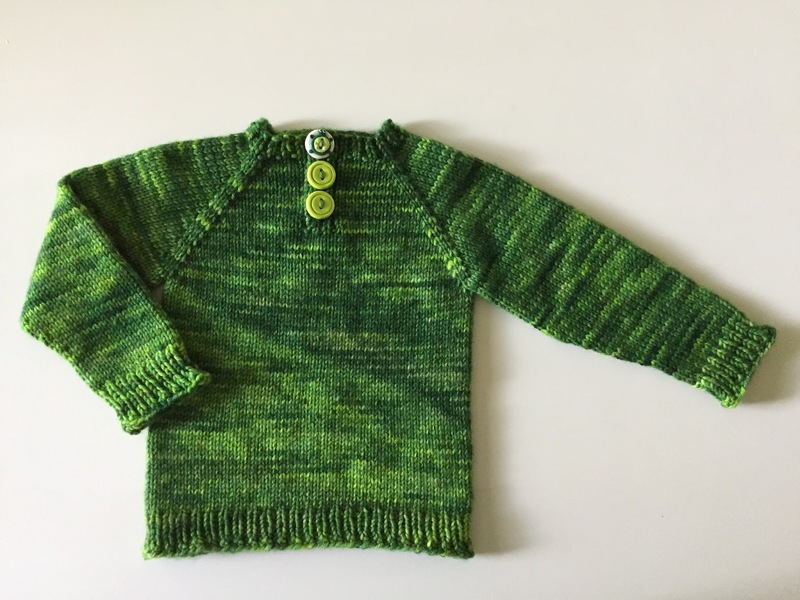 Glad you enjoyed hearing about some of what goes into it - wasn't sure if I'd end up boring the non-knitters to tears with this post but obviously I didn't let that stop me from writing it, LOL. Oh my goodness how adorable!!! You are so talented! All of these sweaters and hats are just precious!